The Project Mission has been to empower Spinal Arachnoiditis Survivors via participation in the Arts as we promote connectivity, healing, and coping tools for Living With Arachnoiditis while increasing the scope of Arachnoiditis Awareness and Prevention. Started as a One-to-One Survivor Portrait Project(2014) and Growing into a Global Community for Creative Wellness; The Art For Arachnoiditis Project is an art, adaptability and empowerment project about living with spinal arachnoiditis. A charitable Creative Wellness Art project of SheilaLynnK Art Studio; it is intended to send an empowering message for change to: arachnoiditis survivors & their support networks, persons living with chronic pain, administrative bodies governing medical policies resulting in adverse outcomes, professionals teaching/administering healing through art, employers who must accommodate arachnoiditis in the work place, and other artists with "disabilities." Injured in 2007, very few practitioners were aware of Arachnoiditis, its origins, presentation, or outcomes were largely unknown to front line medical providers and administrative entities providing disability accommodations, assessments, and compensations. 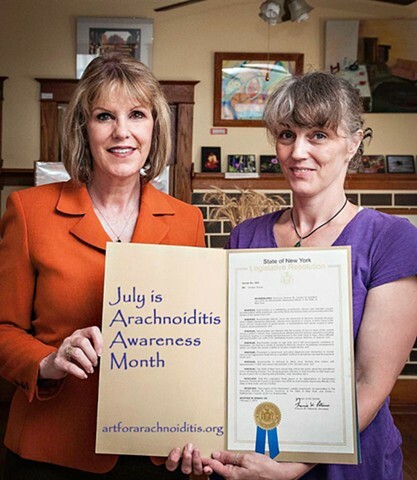 Due to the valuable participation of fellow survivors, local project support and encouragement from volunteers, and with Dedicated Assistance from Senator Catherine Young; the Governor of New York State has proclaimed July to be Arachnoiditis Awareness Month. We received some wonderful art by survivors as we squeaked through Year 3. Although we didn't reach the Year 3 fiscal goals, we are moving into Year 4 with some hopeful adjustments for this FINAL year of the project. I started the Art for Arachnoiditis Project for fellow spinal arachnoiditis survivors in 2014. Originally a one-to-one survivor portrait project; it grew into an international resource for fellow survivors on the site I created for us at artforarachnoiditis.org. 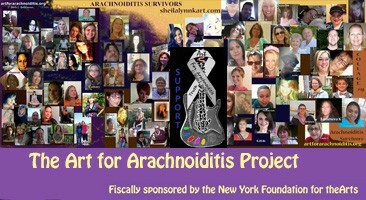 Now fiscally sponsored by the New York Foundation for the Arts; 270 survivors from around the world are currently registered at the Art For Arachnoiditis Project. The connections created here work to defy the isolation of spinal adhesive arachnoiditis. Though this has resulted in the completion of numerous self-prescribed physical milestones in my own recovery, is a source of connection, and has become a rewarding achievement in its own right; it doesn't exactly pay the bills. … AND I have MORE art to make to share. An arts advocate for life; my studio business and creative works are built around the concept of accessible and affordable art. As I work through this last Call for Entries, I have to express my sincere gratitude for the encouragement, support, and participation I have received from so many people as this project evolved over these last four years. the Art For Arachnoiditis Project in August 2018.
during Arachnoiditis Awareness Month July 2018. Creative Wellness Works. Healing is Happening. This FINAL Year Includes a Modified Method to present a FREE Independent Study Creative Wellness Program to Survivors Registered at the Project. Survivors, No payment is required to be eligible to receive the Creative Wellness Program. Upon confirmation of your registration the FIVE MODULES of the program will be sent via the email information you provide as quantities become available. Creative Wellness Program updates and resources will be delivered to you via this mailing list. You must be signed up here AND have a confirmed registration to receive this FREE Independent Study pdf.